As part of the American Recovery and Reinvestment Act of 2009, CSA Ocean Sciences Inc. (CSA) acquired the necessary state and federal permits on behalf of Martin County and implemented a three‑phase (Survey, Restoration, and Monitoring) oyster reef restoration project in the middle St. Lucie Estuary (SLE) and Northwest Fork of the Loxahatchee River. Of over 800 proposals submitted to the National Oceanic and Atmospheric Administration (NOAA), this project is one of only 50 to be funded by the stimulus grant. This project is a significant step towards the restoration of oyster reef habitats once present in the St. Lucie and Loxahatchee Rivers, a goal of the Comprehensive Everglades Restoration Plan. The Survey Phase, completed in 2009, consisted of bathymetric and side-scan sonar surveys within the SLE and Northwest Fork of the Loxahatchee River to characterize and identify estuarine bottom features and help evaluate the suitability of the permitted restoration sites. Following this comprehensive survey, preliminary sites were selected and a restoration site plan was designed based on muck layer depth, salinity levels, water quality, and past existence of oyster beds. Between August 2009 and July 2010, CSA, as prime contractor to Martin County, restored over 26.5 acres of oyster habitat via placement of over 40 million pounds of relict oyster shell, limestone rubble, and concrete in the Northwest Fork of the Loxahatchee River and the SLE. Based on population densities on oyster reefs previously placed in the SLE by Martin County and CSA and a conservative estimate of 20 gallons per day filtered by an adult oyster, it is estimated that this project will provide enough habitat to support an oyster population capable of filtering the entire volume of the St. Lucie River (18 billion gallons) in approximately 30 days. 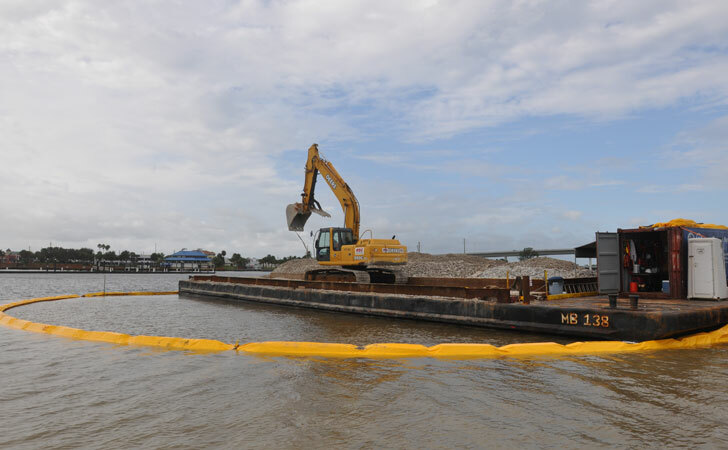 Additionally, limestone rubble will be used to construct oyster bars along some severely eroded sections of the SLE shoreline to act as living shoreline to increase resiliency, create habitat, and reduce muck deposits from erosion. These bars will be planted with mangroves, cord grass, and other plant species. Oyster substrate will be strategically placed to provide the best protection for this planted shoreline. Florida Department of Environmental Protection and Army Corps of Engineers permits required for this project were submitted by CSA and were approved in record time. The Monitoring Phase consists of post‑construction surveys (completed) to confirm the location and areal extent of reef material as well as short-term (2-year) monitoring surveys (ongoing) to document structural development and ecological function. CSA is managing the short-term monitoring surveys and associated research projects conducted by the Fish and Wildlife Research Institute of the Florida Fish and Wildlife Conservation Commission under the auspices of RECOVER (REstoration, COordination, VERification), the Florida Oceanographic Society, Florida Atlantic University, and Florida International University.